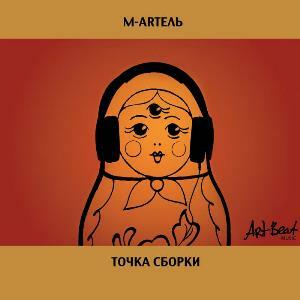 M-Artel is a five piece instrumental band from Russia. This is their first album. Formed by saxophonist Michail Ivanov, the music is generally in a funky jazz-rock mode. Sometimes non-jazz and non-funk influences creep in, like a 'symphonic' keyboard or guitar part here or a folky rhythm there. One track has what I call a 'polka' part but it could be some kind of Russian folk influence while another track goes into reggae for a bit. I can't put my finger on it but I keep getting a 1980s vibe from the music sometimes. "Kebab" is a good intro to the album. Almost a prog metal like atmosphere (but with no distorted guitar) at the beginning with the tom-tom pounding and digital synth soloing. When the sax enters it is more funky and jazz-rock sounding. In the middle things mellow out with sax soloing and some piano. The tempo picks up and everything gets very trad jazz sounding. Returns to the earlier funky jazz-rock part. "Princetrane" starts out very lite and funky with some nice organ work. Changes to a slow funky jam with great electric piano playing. The playing gets more intense and uptempo as the sax solos along before a symph prog style guitar solo. "1980 Summer Olympics" again starts out lite and funky. This has some hard rock guitar added (sometimes playing in unison with the sax). Nice guitar solo in the middle as the mood becomes more subdued. Includes a drum solo later on. "Prelude In C Minor" has a cool synth melody which gets reprised. More hard rock with funky bass oriented until the sax appears, then the music gets more jazzy. Alternates between the hard rock/synth melody and the more trad jazz parts. "Merry Elephants" once again starts out lite and funky. Nice organ soloing at one point. Later changes to reggae with a guitar solo. Last track and title track begins and ends with vinyl surface noise. Very jazzy piece with lots of sax and electric piano soloing. Overall, great playing and great sound and production. The music sounds very 'live' for the most part but there are little studio tricks here and there. Should appeal to those into the funkier jazz-rock side of modern prog. I will give this a 3.5 rounded up to 4 stars.